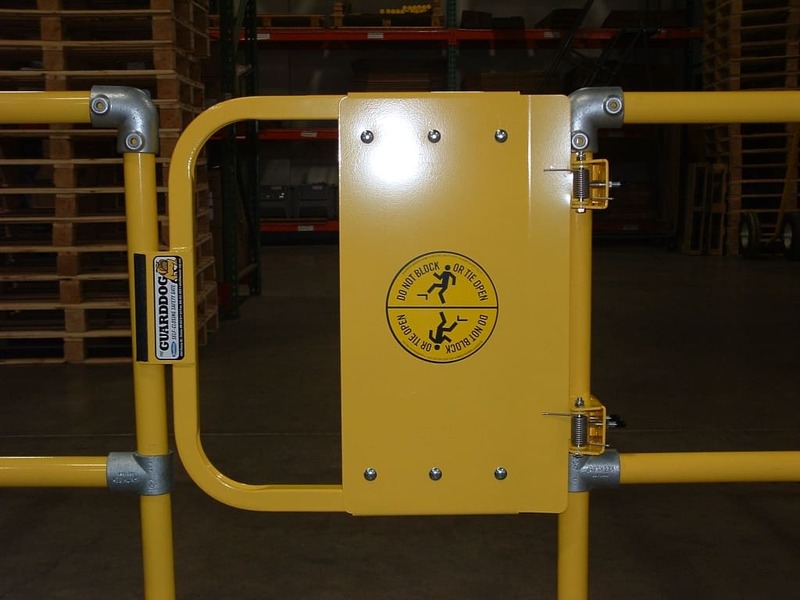 The Bluewater Mfg GuardDog self-closing safety gate is tough, durable and best of all, economical, reliable and easy to install. 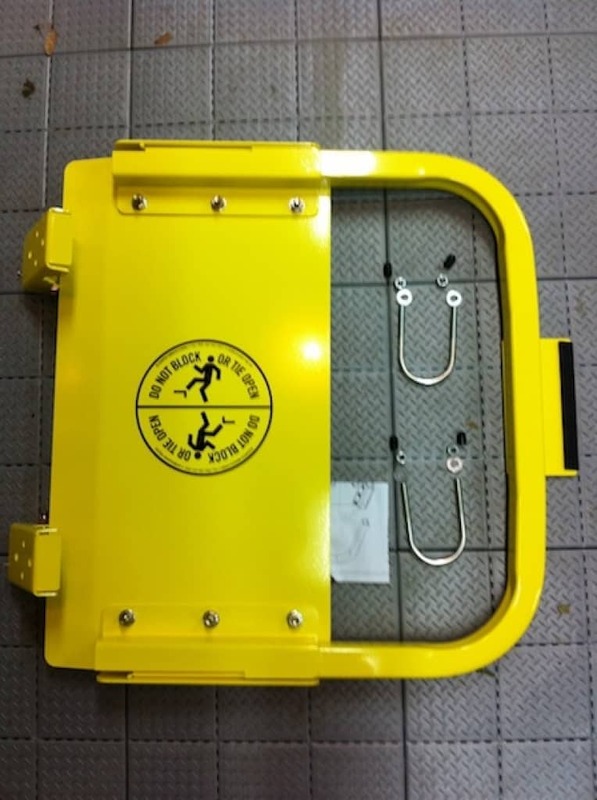 The Bluewater self-closing safety gate arm is dimensioned to provide maximum opening coverage. 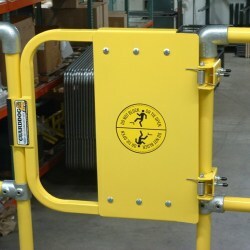 When the Bluewater GuardDog safety gate is installed and the top rail is at the OSHA’s recommended nominal height of 42”, the bottom rail of the gate is positioned at a height of 21”. 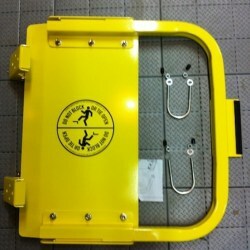 This matches the OSHA safety gate mid-rail height for guardrails. With a large adjustment range of +/- 3” from the nominal size, the gates can be adjusted and sized to fit the opening perfectly. 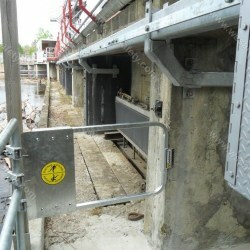 The selfclosing safety gate system can also be used as industrial safety gates for stairs. The self-closing feature employs two stainless steel torsion springs. 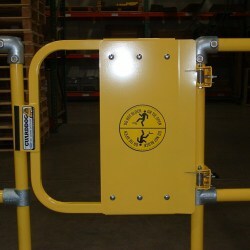 Each OSHA safety gate is capable of universal swing direction. Simply invert gate for opposite swing direction. W.S. 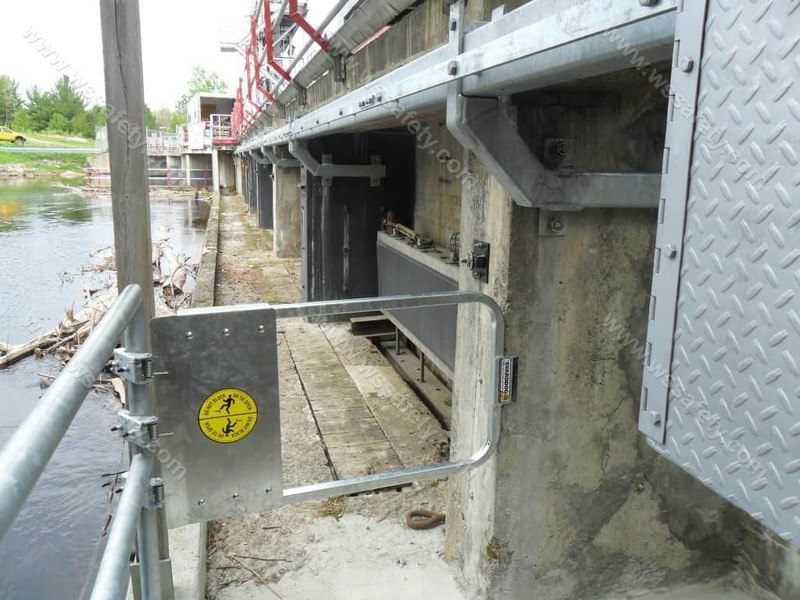 Safety is able to provide an adapter kit to fit many railing sizes. Universal Hinge Assembly fits various railing types up to 2 inch O.D. or flat surface mounting. 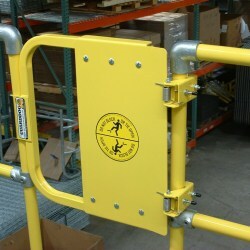 The ladder safety gate comes fully assembled and includes U-bolts for standard installation. It requires only one 1/2” wrench and 5 minutes of your time for installation. 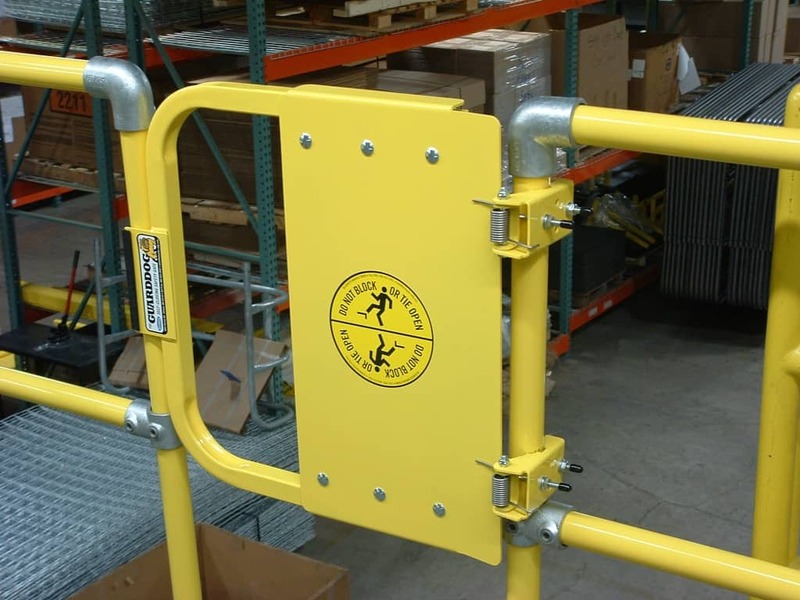 The OSHA Ladder Safety Gates come in 5 nominal sizes and are adjustable laterally up to 6” (-3” to +3” of nominal size) to ensure the gate fits properly in your opening for maximum safety. 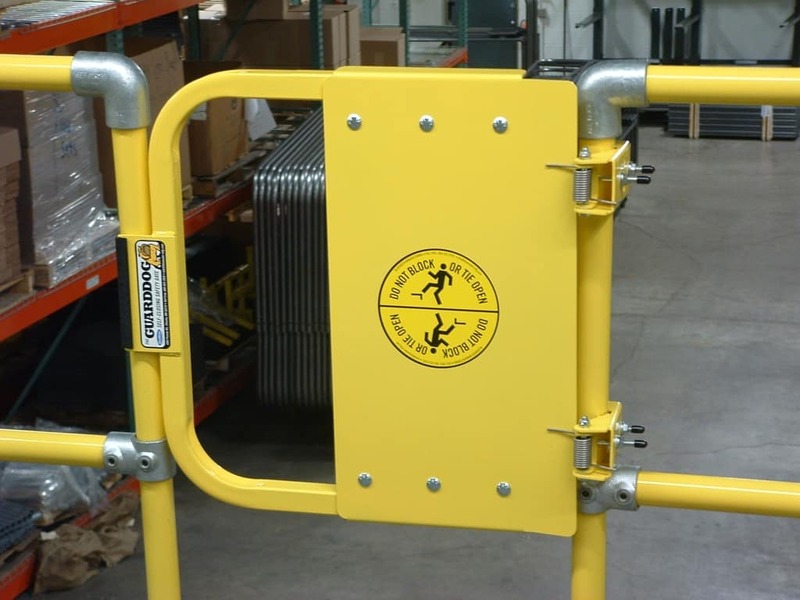 You have a choice of a mild steel gate with a Powder Coat Safety Yellow or Hot-dip Galvanized finish, or you can choose a Stainless Steel ladder safety gate. Custom design and options may be available.